Zimbabwe Orders Second Internet Shutdown In A Week Of Deadly Protests Critics accuse the government of constricting Internet use to stop the circulation of images showing a security forces responding violently to protests over increased gas prices. On Wednesday in Harare, Zimbabwe, a police officer stands guard over people who were arrested during protests against increased gas prices. Zimbabwe has constricted Internet access amid a week of deadly protests following an increase in gasoline prices. Econet Wireless Zimbabwe, the country's largest mobile phone operator, said early Friday that it had been directed by the government to shut down all Internet access for the second time in a week. "We were served with another directive for total shutdown of the internet until further notice," Econet said in a statement, Reuters reports. The carrier noted that all networks and providers in Zimbabwe had suspended services. Later Friday, Econet said it had received orders to restore access except for some social media applications, Reuters reports. Critics say the government wants to limit Internet access to halt the circulation of images showing security forces responding violently to protests. Photographs show a protester with a broken leg, another with a split lip, and others of protesters being arrested. Activists were challenging the restrictions in court. The Zimbabwe Human Rights NGO Forum says the Internet restriction is "unwarranted, unjustifiable in the circumstances and is a tool of repression meant to mask the massive human rights violations which the state was preparing to commit." The protests began after the government more than doubled the price of gasoline. Zimbabwe now has the most expensive gas in the world. The government has confirmed three Zimbabweans died in the protests, Reuters reports. The NGO Forum says at least 12 people were killed. As NPR's Ofeibea Quist-Arcton reports from Johannesburg, "a Zimbabwean medical association says its doctors have treated more than 150 people since Monday — some with gunshot wounds, others with dog bites." The United Nations says it has received reports of security forces using live ammunition, conducting door-to-door searches and arresting more than 600 people nationwide including opposition leaders and activists. "We call on the Government to find ways of engaging with the population about their legitimate grievances and to stop the crackdown against protesters," a spokesman for the U.N. High Commissioner for Human Rights said in a statement. A prominent Zimbabwean pastor, Evan Mawarire, was arrested during the protests. His lawyer Beatrice Mtetwa told AFP on Thursday that her client is accused of subverting a constitutionally elected government. "The allegations are that he said the government must attend to economic challenges ... and that people must be paid in U.S. dollars," she says. "We don't know what is criminal about that. Everybody is saying that. So everyone who is saying that is subject to arrest." President Emmerson Mnangagwa said the price increase was needed to combat nationwide fuel shortages. Mnangagwa was elected last year after the dictator Robert Mugabe stepped down following 37 years in power. Initially, Mnangagwa was seen as a more liberal leader. As NPR's Eyder Peralta reports: "Mnangagwa ushered in an era of historical civic freedoms: Police checkpoints were lifted and for the first time in decades Zimbabweans were allowed to air political views. On election day, last month, many of them said that for the first time, they felt free to walk into a polling place and vote their heart." Now Mnangagwa is seen as potentially an even more repressive leader than his predecessor. 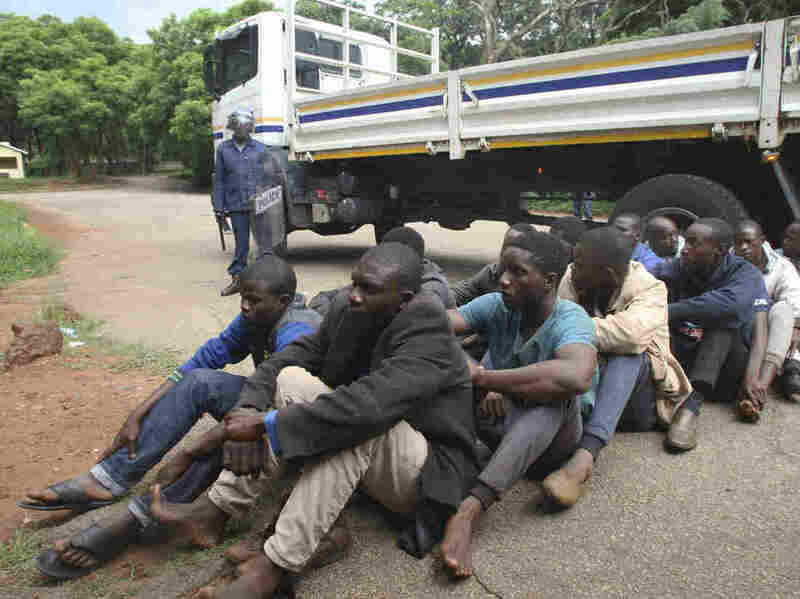 "Our country is going through one of the most trying periods in its history," the Zimbabwe Catholic Bishops' Conference said in a statement criticizing the government's "intolerant handling of dissent," The Associated Press reports. The government's earlier Internet shutdown request, which lasted for two days this week, was challenged in court by media and human rights groups, reports New Zimbabwe. The U.S. Embassy in Zimbabwe issued a statement Thursday condemning the internet shutdown. "We are concerned by the Zimbabwean government's blocking of Internet services in the country January 15-16 and urge the restoration of access to social media sites and applications," the embassy said in a statement. "We call on the Zimbabwean government to respect its constitutional and international legal obligations regarding the right to freedom of expression." The partial lifting of the internet closure should ease the economic impact of a web shutdown. Teachers and other public workers who draw their salaries via mobile payments from the government were suffering without internet, the AP reports. Some government workers could no longer pay for public transportation.